If one series of digital cameras has been successful it is the IXUS series from Canon. Since 1996 a total of 30 IXUS models (digital and analogue) have been released (including the new models). The new IXUS 500 is the flagship of the series from today. The stainless steel IXUS camera is a success since 1996 and with the launch of this new top model Canon will expect to maintain the same success as in the years before. In May 2000, the first Digital IXUS was released and immediately marked the beginning of a string of successes for Canon in this stylish designed compact segment. The new IXUS 500 is protected with superbly finished stainless steel bodies with the traditional IXUS feel. The new IXUS 500 distinguished itself with a gold ring circling the lens barrel. Image capture: Images taken with the 5.0 Megapixel Digital IXUS can be printed up to A3 size without image quality degradation. 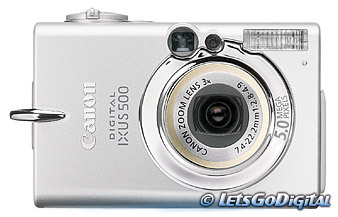 The Digital IXUS 500 includes a 3.0x optical zoom. Optical zoom ensures that the full sensor size is employed when closing in on a subject, so pictures taken with the zoom do not suffer from image degradation. The camera features 9-point Artificial Intelligence Auto Focus (AiAF) for fast and sharp images, even with off-centre subjects. Superb images, no waiting: All Canon digital cameras up to the EOS 10D DSLR feature the same dedicated DIGIC processor. DIGIC delivers superb colour rendering and image quality, handling all the complex algorithms required to make colours brighter, images sharper and focusing crisper. It does this with unrivalled speed and efficiency, making for highly responsive cameras and eliminating the phenomenon of staring at the back of the camera waiting for an image to display. iSAPS technology uses camera settings and environmental data to predict the most likely scene and makes adjustments accordingly. Moving pictures: The IXUS 500 features 3-minute QVGA or QQVGA movie clips with sound recording, full playback and in-camera cutting and editing. The camera can also capture high-resolution VGA movie clip up to 30 seconds at single recording. When connected to any Canon compact photo printer, the IXUS 500 include 'Movie Print' mode. This extracts a succession of up to 63 (63 images when printed on a postcard size paper (100 x 148 mm) individual and evenly spaced movie clip frames from any given movie clip and automatically prints them as thumbnails on a single sheet of postcard size paper (100 x 148 mm). This is ideal for freezing and analysing or admiring action sequences such as a golf swing. An "ID Photo Print" function prints a number of durable passport photograph size images (of selectable height and width) to a single sheet. Simple photo printing and PC connection: The new IXUS 500 also include Canon's new Print/Share button. When connected via USB cable to any PictBridge or Direct Print compatible photo printer or Windows PC, a blue light on the Print/Share button lights up to indicate successful connection. Pushing the button when lit instigates a print of the currently displayed image (based on the connected printer's default settings) or an automatic transfer of images to the PC (Requires application software provided to be loaded on the PC and camera pre-settings to be selected ). The camera transfers all images, all images not yet transferred, or all images marked for transfer, depending on the user setting selected in the camera's set up options. Options to shoot anywhere: For diving, surfing and skiing, an optional waterproof case is available, giving the cameras full protection to a depth of 40 metres. Optional car battery adaptors are available for the Digital IXUS 500, while extra power adaptors and optional soft cases are available for all models.